Today’s highlight is one of those offers that just keeps getting renewed. 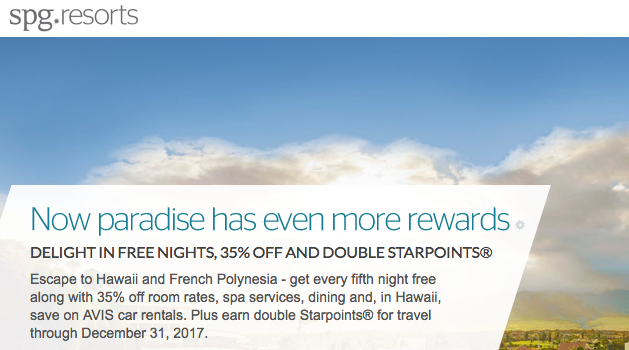 The Double Starpoints, up to 35% off and 5th night free for stays in Hawaii and French Polynesia has been extended to December 31. I have actually taken advantage of this offer and I can let you know that it can be stacked with the main systemwide SPG Bonus like the current Explore More offer. Other bonuses to look at today include Cathay Pacific’s newest bonus for flights out of the U.S., Iberia’s newest Accor stay offer and Qatar Airway’s Chiang Mai flight bonus. points! Book by Sep 29 for stays until Mar 31, 18. Find out more here!